Do you know that there are people who essentially throw their leaves away? They rake them out to the curb and wait for someone to haul them away. I find that amazing because those autumn leaves are a valuable commodity for your garden– yet they’re free! Here are five tips on making the most of autumn leaves. 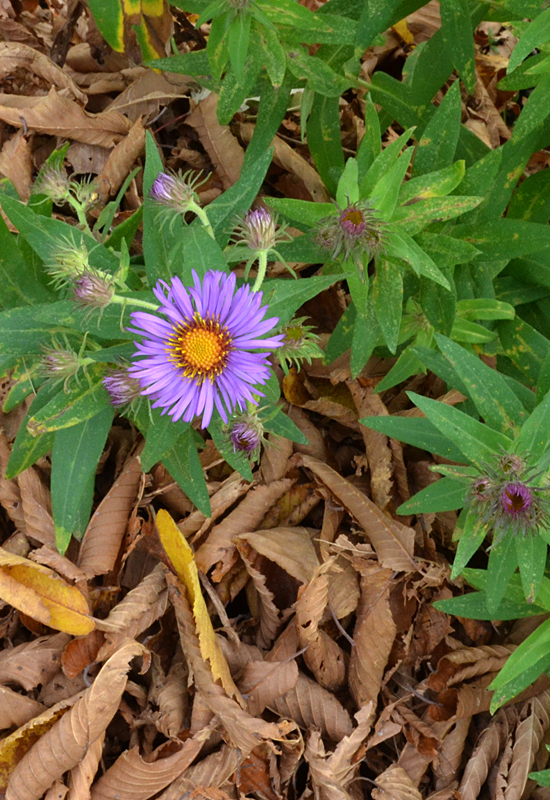 Tip #1: Use leaves as mulch around your perennials to help them survive the winter. If we have a harsh winter this year, February isn’t the time to try to protect your perennnials. You have to take action in the autumn to protect your plants, as Carol Ann Harlos, Master Gardener coordinator for the Erie County Cornell Cooperative Extension, told us last winter. We were lucky last winter because we had a lot of snow. The snow acts as insulation and protects the roots of the plant. But what if we get a winter that’s cold, but not snowy? 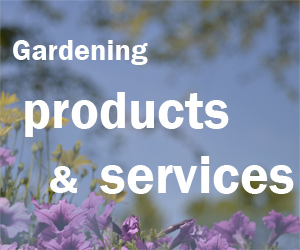 To ensure that your perennials are protected even then, mulch around your plants now. Leaves are great for that. You can use them whole or chop them up with your lawn mower. Tip #2: Use leaves to insulate your herb garden. Last year, Caesandra Seawell, garden manager at the garden at City Honors School in Buffalo (also known as Pelion Community Garden) showed us how they use a thick blanket of leaves to insulate their herb gardens. After two frosts last fall, the parsley was still green. Then we had a very cold winter. We checked back with Seawell in May and she said the bed buried under leaves still had sorrel, red veined dock, rue, oregano and lovage. Tip #3: Use those leaves to create a lasagne garden. As we told you last week, in lasagna gardening, you layer the material in your garden. The first layer is cardboard or a thick layer of newspaper. Over the top of that, you alternate layers of grass clippings, leaves, manure and peat moss—or whatever you’ve got. You need to build it up so it’s a foot deep. This is a great way to use those autumn leaves. Tip #4: If you don’t have a lawn mower with a bag, the best way to chop and collect fallen leaves is to rake the leaves onto your asphalt or concrete driveway and run them over with the lawn mower. That tip is from Jim Charlier, author of the blog Art of Gardening. He has also been a leader in Garden Walk Buffalo and the National Garden Festival. Chopped leaves can be used as mulch on top of a garden bed or you can throw them in your compost pile. The leaves will decompose more quickly if they’re chopped up than if you leave them whole. When you chop up the leaves on your lawn, those tiny bits of leaves will get lost in the grass. That’s fine for the lawn, but it isn’t an efficient method if you’re trying to move chopped leaves your perennial beds or herb garden. When you chop leaves on a concrete or asphalt driveway, the tiny bits of leaves will fall on the asphalt and be easy to sweep up. Wait until the leaves are dry. They crumble up much better that way. Rake the leaves into small piles onto a driveway. Starting with a big pile might seem like a shortcut, but it actually works better if you mow a small pile. Run over the leaves with the lawn mower, aiming the lawn mower so that the pieces spray onto the driveway. Last year, my husband, my neighbor and I spent a couple hours raking and crunching up leaves from both our yards. It was a pleasant task on a warm, sunny fall day, and I got several garbage cans full of leaves that I spread on gardens and added to the compost pile. That generous neighbor also got some of the great compost for her garden beds. Tip #5: Use your neighbor’s leaves. If you don’t have enough leaves for your gardening projects, don’t go without. As I said at the beginning of this article, many people just throw their leaves away. If your neighbors are going to rake their leaves off their lawn all the way to the curb, ask them if they’ll rake them over to your driveway instead. And if they go to the trouble of bagging up the leaves, don’t be shy–Ask them if you can have a few bags. I’m sure they won’t mind. Should those of us who have a lot of Maples suffering from tarspot use leaves in this way? I surmised that removing the affected leaves in Fall might reduce the fungal spores. To be greener, instead of using your lawnmower, you can put the leaves in a garbage can and use an electric grass whipper to shred the leaves. 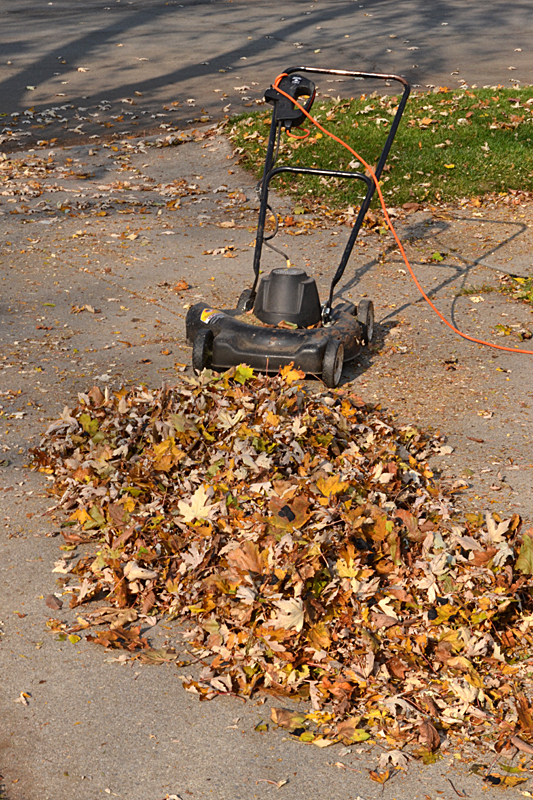 As with the mower, the leaves should be dry and only do about 1/3 – 1/2 of a can at a time. It’s more labor-intensive and not as fast as the mower, but releases less pollutants. I’d suggest wearing a mask for either process because it sure raises “dust”, but it makes fantastic mulch. I even asked my neighbor to throw his leaves over the fence so I’d have more “product”. Enjoy the fall everyone! We have lots of mature trees – mostly oak and maple – and we make use of the leaves every fall. I like them for mulching perennials because they’re easy to clean up in spring when they’re wet and sticking together. When I mulch plants in fall I try to do it when the leaves are dry so there’s an thick, airy layer prior to snow covering. We spread them on the empty veggie garden and till them in the following spring, too. I use a non-power reel mower to chop leaves..Love the bagged ones pre-mulched by a dear friend with mulching vac. Pam, I just interviewed Carol Ann Harlos, Master Gardener coordinator for the Erie County Cornell Cooperative Extension, for a story for next week on tar spot. She said that Cornell doesn’t recommend using leaves with tar spot in your compost because a home compost pile won’t get hot enough to kill the fungus. However, tar spot doesn’t damage the tree; it’s just ugly. If you don’t care about tar spot, go ahead and use the leaves in your compost or on garden beds. Plus, it’s difficult to remove all the leaves affected with tar spot. Even if you get rid of all your leaves, neighbors might have trees with tar spot. In my non-expert opinion, it sounds like a lot of work that probably won’t pay off. Diane, what a creative! I think people might want to use eye protection, too. If you’re looking into the garbage can, it would be easy for pieces to fly up into your eye, I think. Thanks for sharing. Sue, whole leaves don’t break down much during the winter, do they? Piling up the leaves on your garden beds when they’re dry so that you’re trapping the air is a good tip, too. Thanks! Thanks Connie (and Carol!). Indeed we can’t separate out all the tar spot leaves, although I tried mightily for a few years, hoping that reducing the spore counts at least would help. The maples affected wax and wane with the severity of the tar spot, so I’m glad to know I can at least continue to mulch. Makes raking our large back yard a lot easier. I’ll look forward to the article on tar spot. Sara, those old-time reel mowers were heavy. Do you have a newer model? Yes, I’m looking forward to some chopped up leaves from this year as well now that my neighbor has a lawn mower with a bag on it. Connie, No the whole leaves are pretty much intact in spring, but they kind of pack down & lock together and it’s easy to rake or pull them away from plants and put in the compost. I have a newer Scotts model…bought from Amazon..free shipping…came in the mail…small lot/aerobic exercise. Kids down the road from me used leaves to stuff a pumpkin bag and scarecrow. Sue, talk about reusing materials! After Halloween the leaves can go on the compost pile! Sara, that sounds like a great way to get exercise. I’d rather ride my bike to the supermarket than drive to a gym. Is it okay to use Black Walnut Tree leaves as mulch and compost? Eve, I don’t know whether you can use black walnut leaves as mulch or compost. I have a call into Cornell Cooperative Extension to try to find out. Thanks let me know. I bagged most of them up today. Eve, the Master Gardener who called me back said the short answer is that you should bag up the leaves and throw them away. The black walnut tree puts out a chemical to defend itself that kills many other plants. The biggest problem is what it puts out from its roots, but the leaves could be a problem, too. It’s not something you want to fool with because it can be such a deadly thing to so many plants, she said. I use unmulched leaves annually in the fall mostly in our vegetable garden. About a foot deep and collected locally from discarded bags or from road piles ready for town pickup….These are rototilled into the soil in the Fall. By planting time in May they are just about all disappeared. The many remaining saved bags are then used for mulch and ground cover on rows between plantings of veggies. These also are all just about gone into the soil by autumn. Come anytime and see my rich black soil. Thomas, thanks for that new twist on using fall leaves. And you’re so lucky that people package up their leaves for you to use!